PHOTO COURTESY OF KELRIK PRODUCTIONS: Kelrik Productions explored adult themes in its penultimate Central Coast show, Cabaret. Just three weeks off a month-long run of Cabaret, Kelrik Productions is poised to stage its final production on the Central Coast, three performances of Into the Woods July 16-18 at the Spanos Theatre. The fairytale is the fifth show of Kelrik’s 2010 season, titled "Breakaway" after singer Kelly Clarkson’s second album. Last summer, Kelrik Productions’ co-founder Eric Austin attended Clarkson’s concert at the Mid-State Fair. Her song “Breakaway,” inspired him to, as the song’s title suggests, leave his small hometown and seek his fortunes in a bigger city. He decided to move to San Diego after the 2010 season had concluded, and to make his final shows on the Central Coast a celebration of six years of memories and performances. In December Austin proposed to his boyfriend Matt, and the two are planning an August ceremony at the Madonna Inn as the grand finale to a very active theatrical season. Meanwhile, Austin is preparing for his production company’s 100th show; he calls it fate that he decided to leave after the season that happened to coincide with such a major production landmark. Austin co-founded Kelrik Productions in 1993, along with his sister Kelly. As children they would stage plays together, and they combined their first names to name the company Kelrik. Austin’s sister is now a public defender in San Diego, but he never strayed from his youthful passion. After graduating from high school in San Luis Obispo, Austin moved to Los Angeles and staged family-friendly fare that earned the designation “Best Children’s Theater” by LA Parents Magazine in 2000. After moving back to San Luis Obispo in 2003, Austin formed an unexpected relationship with Leona Evans, the minister at Unity. She was looking for someone to help get a production off the ground and Austin appeared at the perfect time. To help build his credibility within the theater community Austin began auditioning for other companies, acting in any show he could find. “I thought I could start auditioning to get in and meet people and then recruit them for my shows,” he explained. 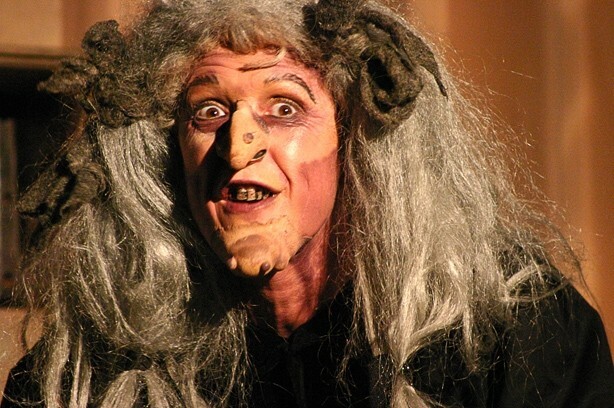 His plan worked and before he knew it he was back to staging six productions each season, a hectic pace he had set in L.A.
EVERY FAIRYTALE MUST HAVE ONE : Erik Austin’s farewell to the Central Coast, Into the Woods, features a host of fairytale creatures. “When I moved here I always thought I was going to tone it down but our season’s seven months and six shows,” he said. A lot of factors went into selecting the final five shows. Austin wanted to pay tribute to old favorites, but also try something new. He had seen Seussical at PCPA, but never staged it himself. He’d also seen Cabaret twice, but because he shied away from adult content, never decided to take it on. At last year’s award show—an annual event called The Austinis—attendees voted for the shows they most wanted to perform the following year. Bye Bye Birdie was among the productions to receive the most votes. Oliver! was the first show staged by Kelrik Productions on the Central Coast. The final show was supposed to be a production of Beauty and the Beast, but Disney revoked the license to perform when the musical hit the road in a national tour. So Austin was left with his original choice, Into the Woods, which he had originally abandoned because he wanted a production with a larger cast. “I just wanted to show, look at the full range of what we can do,” explained Austin who jokes that the season takes audiences around the world and then some, to Sweet Apple, Ohio; Berlin; London; the Jungle of Nool; and a fairytale land. Kelrik Productions has staged Into the Woods before, and Austin managed to avoid the audition process by casting many of the same actors in the same roles. The fairytale production has a sly adult edge, making it a perfect choice for a production company that caters to youthful audiences. Encouraging parents to take their children to the theater is a special cause to Austin, who observes that parents take their children to basketball, soccer, and swimming lessons but rarely engage them in performance art. His goal was to create an experience that would be welcoming to all ages. Many of his actors are also pint-sized. “I treat the children the same as I treat the adults,” he explained his approach to directing. “I just make sure I don’t use any curse words, which is hard sometimes. Sometimes kids get it faster than the adults, which is hilarious.” He makes a point of establishing a serious tone during rehearsals, and distinguishing between rehearsals and standard playtime. TREE HUGGERS: Into the Woods runs July 16 and 17 at 7 p.m. and July 18 at 2 p.m. at the Spanos Theatre. Tickets cost $25-$27.50 and can be purchased by visiting pacslo.org or calling 756-2787. For additional information visit pacslo.org. But Austin makes sure that his actors and supporters have opportunities for fun as well. On June 16 Kelrik Productions celebrated its 2010 season with the 4th Annual Austini Awards. It began when a friend jokingly recommended that Austin host his own award show and call it The Austinis. The fundraising event features drinks, an auction of items supplied by local businesses, and highlights from the season’s shows. Then, attendees vote for the winner of more than one dozen categories including staples such as best supporting actress and actor, best male and female vocal, best lead actress and actor in addition to Kelrik-specific categories like favorite pickpocket, favorite jungle animal, and favorite who. Even at the best of times, the Austinis can be an emotionally charged evening. But within the context of a move and slew of farewells, the event hit some pretty sharp emotional peaks. Of course, Austin has to keep some energy in reserve for his lone weekend of Into the Woods. Not to mention his August wedding ceremony. And move. But his love of theater, and theatricality, will help carry him through his final months in SLO, and the challenges of launching a new life in a new city. You can bet that theater will be a prominent feature in this new life. “I just love the craft of acting. And I love theater. And I especially love musical theater. I think musical theater brings joy to everyone,” concluded Austin. Arts Editor Ashley Schwellenbach is broke but not breaking away. Send train tickets to aschwellenbach@newtimesslo.com.